How much should I water? How do I know when to water? Why is pH important? What temp should I keep my room? What size container should I use for my plants? Why did my plants die when I transplanted them? Can I plant multiple plants in one container? How do I take a cutting and successfully grow it? Is it okay to mix different nutrients for my plants? Why is my water pump always clogging? Why do some people use water filters for their systems? Why are the tips of my plants brown and dry? How do I fix plant burning without a meter? How do I fix plant browning if I have a meter? I have pest problems %$&*! What can I do? What are EC and PPM? How do I make sure my nutrient solution is the right strength? Do you sell black magic where I live? When watering plants in any growing mediums design for hydro water the containers until water begins to drain from the bottom allowing the substrate to become fully saturated. (Especially fast draining substrates like Black Magic Pro Peat Blend or Black Magic Coco Coir Mix). Watch out if plants are especially dry though; you might need a little extra water to soak the medium. Approximately 10% to 20% runoff is a good rule of thumb. Proper hydration = maximization. That a plant needs water is no mystery, but knowing when to do it isn't always as clear. For plants grown in containers of growing media, like Black Magic Pro Peat Blend or Black Magic Coco Coir Mix, you can tell if you need water by sight and touch. (Media that needs water is lighter in color on the surface and lightly damp to the touch, not wet.) To gage how damp any growing media is, feel down into the soil about an inch or two to where the roots are. For pure water culture in a recirculating system, keep the reservoir at the proper level per the manufacturer's instructions. To maintain a balanced nutrient profile in a reservoir system, (recirculating, aero, ebb and flow, etc.) we recommend that you completely change it out every 7 to 10 days. It's normal to see levels gradually depleting between reservoir changes as the plant takes up the nutrient solution and evaporation occurs. Topping off the reservoir with water (pH balanced at 6.0) in between reservoir changes keeps nutrient solutions strong. PH is on it's most basic level the measure of acidity/alkalinity in water or soil and impacts how readily available plant nutrients are. To adjust, use a pH up or down product designed just for plants, which excludes pH adjusters used in pools and spas. Typically, for pure water culture in a recirculating system, shoot for a pH of 5.8-6.2. If your pH drifts beyond that, adjust when over 6.5 or under 5.5. If you're growing soilless in media like peat or coco coir, aim for a 5.5 - 6.5 pH. What temp should I keep my room? For most plants, a room temperature of 70°F/21°C is perfect, but keep in mind that some tropical plants benefit from higher temperatures. (Be sure you have proper ventilation and air circulation if you're growing indoors). What size container should I use for my plants? Your container size really depends on what you're growing and how big the plant is. Keep in mind that as long as there's support to keep the plant upright and space for the roots and stalk to grow, pots can be as small as three inches. For larger, more water hungry plants, like tomatoes or peppers, it's best to use at least a three-gallon container. The smaller container, chances are the more frequent the watering. Why did my plants die when I transplanted them? 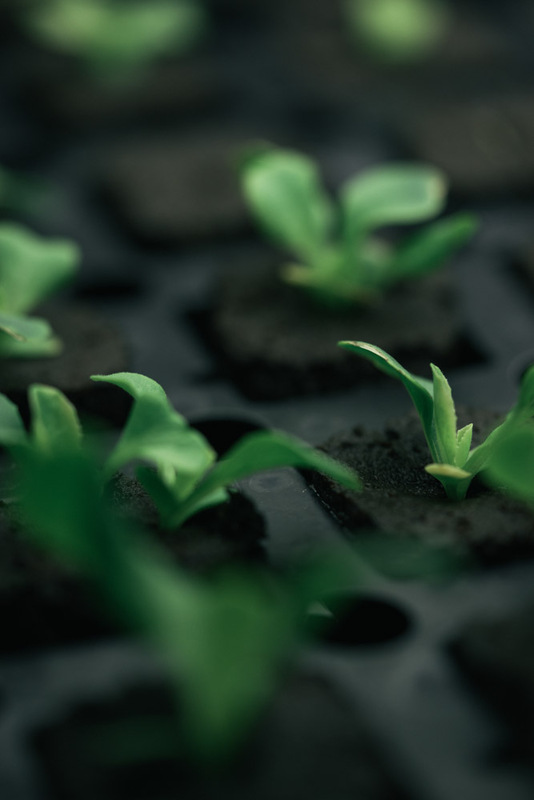 Transplanting can be super stressful for you and your plants, but luckily there are steps you can take to make the transition easier. If you're transplanting from one environment to another, especially indoors to out, it'll be hugely beneficial to your plants to acclimate or harden off them before transplanting. Simply take them outside for a bit each day, gradually increasing over a few days. Keep them in the shade at first and then slowly move them into the sun. Plants dig consistency, so if you're going to change their routine, do it gradually. When you are ready to transplant them into a new container, be gentle with the roots, try to keep them intact, and make sure they are well watered after transplanting. Can I plant multiple plants in one container? This entirely depends on what you're trying to grow and how big you're trying to grow it. For the big guys, like tomatoes or peppers, you'll definitely want to go one plant per container. But for other types of plants like lettuce, herbs, and flowers if the container is large enough, you can feel free to grow them together. Keep in mind whether you're growing hungrier fruiting or flowering plants or just want more control, separate containers allow you to best manage each plant's nutrients… which is paramount if you're growing for performance. How do I take a cutting and successfully grow it? Cuttings are a great way to start new plants (Though we're also huge fans of growing from seed). To get started just dip the cut end into a rooting hormone solution before planting in order to trigger roots. Then carefully plant into the soilless growing medium of your choice or into a Black Magic Seed starting plug. Is it okay to mix different nutrients for my plants? Base nutrients – these contain everything plants need from seed/clone to harvest. It's not a good idea to mix multiple base nutrients together in the reservoir because that can cause over-fertilization making your nutrient solution toxic to your plant. For instance, if you're using a two-part base nutrient like Black Magic Base Nutrients A & B and then add another base nutrient, you will alter the balanced nutrient profile that A and B are formulated to give and risk feeding your plant an unintended toxic concoction. Supplements — Plant-enhancing micronutrients (or supplements) like Black magic Bloom Boost or Black Magic All-Purpose Supplement are compatible with Base Parts A and B. Don't go too crazy though, sometimes less is more. Start with the base nutrient for a few grow cycles and then try additives to enhance your plant's flavor, aroma, size, color or bouquet. Oh, and don't mix fertilizers together before diluting them completely and never pour back into bottles to avoid contamination. Also, it's always best not to mix nutrients in a reservoir where roots are growing if you don't want to burn the roots… trust us, you don't. Why is my water pump always clogging? If your system is clogging it's a time to clean it out. Soak hose lines in hot water or a simple bleach solution — one tablespoon per gallon water — to remove buildup. NEVER LET BLEACH SOLUTION ENTER THE ROOT ZONE and always thoroughly clear out bleached lines before feeding. Check hoses to make sure no debris is left after washing. If your pump has a filter, remove it, rinse it, and if there's a lot of wear and tear, replace it. Why do some people use water filters for their systems? 1. Hard-water — Hard water has an excess of minerals, usually calcium and magnesium, that can cause buildup and damage to hydroponic systems over time. 2. Chloride excess — Although calcium is an essential plant nutrient, it can become toxic at much lower levels than other nutrients. Some growers remove contaminates in order to have complete control over everything that touches their crops. Municipal water suppliers can analyze your water quality or you can determine whether you have hard water by testing the PPM* right out of the tap — anything above 240 ppm has high levels of calcium and iron and is considered hard. Why are the tips of my plants brown and dry? There's a good chance what you're seeing is plant burning caused by an excess of fertilizer. No worries, you can stop the damage quickly by changing out your reservoir water and using a lower dosage of nutrients. How do I fix plant burning without a meter? For plants grown in soilless mediums — leach out the excess nutrients and salts by watering with pure water (adjust pH to 6.0) until water drains out the bottom. This may need to be done a few times depending how severe the issue. Try a 1:1 ratio for any system that drains to waste. So, with a five-gallon pot, push five gallons of pH-balanced water through the root zone to make sure excess salts are removed. For plants is soilless systems — the principal is the same, leach the root zone by passing pure water over the roots until most excess salts have been removed. This great way to correct over fertilization, deficiencies or toxicities. Try running your system for 24 hours of pH-balanced water before dumping and remixing again with fertilizer. How do I fix plant browning if I have a meter? High performance growers might have a meter (EC or PPM or TDS) to test the runoff. Say your leach solution registers at 200 ppm and your reservoir after leaching the first time is 600 ppm. You'd continue to leach until the reservoir runoff is less than double the starting solution or in this example 390 ppm or less. Each time you leach try running your system for 24 hours of pH-balanced water before dumping and remixing again with fertilizer. Once your solution is 390 ppm or less you've just successfully hit 'reset' on your plant and it's ready to start feeding again. I have pest problems %$&*! What can I do? Dang... sorry to hear that. It happens to the best of us. But no matter your skill level, the answer is the same: Eradicate the bastards. The most common indoor pests are spider mites and fungus gnats. If you aren't able to confidently ID the bug, take a contained sample to your local grow shop or take a picture and send it us or look online. In many cases you can use organic remedies. Depending on what you're growing, there are different types of products out there. Do your research to be sure you're fighting the right insect. Also, make sure an insecticide can be used on your specific plant and make sure to follow the correct harvest intervals before ingesting anything you grow. What are EC and PPM? How do I make sure my nutrient solution is the right strength? EC stands for electrical conductivity and PPM stands for parts per million. And they're both measurements to make sure your nutrient solution is at the right concentration. We suggest using an EC meter to measure your nutrient solution and sticking to the recommended nutrient rates on our products. For seedlings — don't exceed 300 ppm total. For vegetative plants — 900 ppm total is your safest bet. For plants leaving the vegetative cycle and entering flower (12/12 hr light) — it's best not to go over 1350 ppm. Keep in mind, these are general guidelines. Some plants might love a little 'hotter' solution while some might not, but at least now you know the starting sweet spots. Do you sell black magic where I live? We Hope so. Give us a call at 1-866-882-0850 or use our store locator to find out.